Offering you a complete choice of products which include long radius bend. 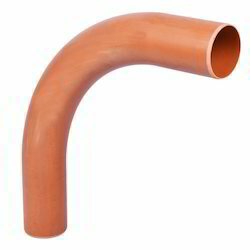 Our expertise can be shown in the products range of Long Radius Bend manufactured by us. We prepare these bends with the help of top quality iron ore, metallic alloys and stainless steel and impose the designs and characteristics in it desired by the clients. With long radius and minimum wall thinning these radius bends never suffer from wrinkles. Made according to the industrial specifications these bends are durable and strong.